When I glanced at the thermometer this morning it was two degrees. No wonder I’m dreaming about coffee today. 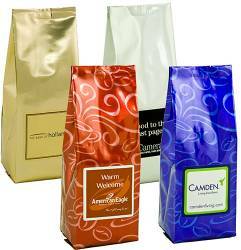 And we’ve got some great ideas for utilizing gourmet coffee as promotional gifts. Stand out from the crowd with our new stand up gourmet coffee package. 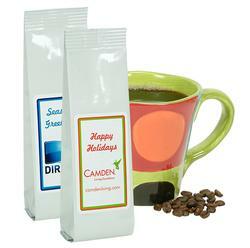 This new coffee packet stands upright on a table making it an attractive thank you or promotional coffee gift. 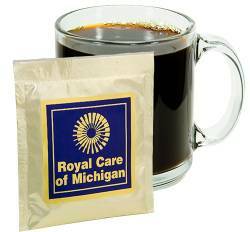 Brews one pot (10-12 cups) of Arabica gourmet coffee and fits inside your mug. Each gloss white foil package contains 1.5 oz. of fresh roasted ground coffee. 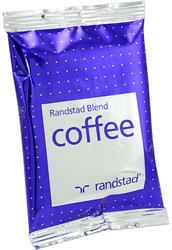 Available in Christmas Blend (seasonal), Richard’s Blend or Vanilla Hazelnut. Available with other premium coffee flavors for orders of 250+ pieces. 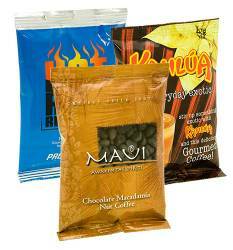 A large package of our fresh roasted gourmet coffee packaged in a stay-fresh foil bag (kosher). Each 8 oz. package yields approximately six full pots of coffee. If not specified, ground coffee is assumed. Whole bean coffee available, indicate “Whole Bean”. Bag colors: Gold, Silver, Black, White, Designer Blue or Designer Red. Flavors: Richard’s Blend, Richard’s Blend Decaf, Colombian Supremo, Kona Blend, Italian Espresso Blend, Double French Vanilla, Hazel Nut and Cinnamon Crumb Cake. Other custom flavors and blends available, please inquire. The rich flavor of Colombian gourmet coffee with the convenience of a single serving package (yields one mug). Each package contains 100% instant kosher Colombian coffee. Simply add (10-11 oz.) hot water and enjoy! 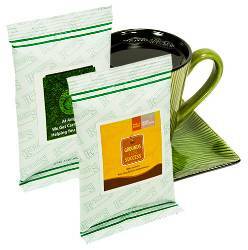 This Arabica coffee bag fits inside a mug and brews one pot (10-12 cups) of fresh roasted Kosher gourmet coffee. Great for complex graphics — prints directly on front and rear wrapper. Flavors: Richard’s Blend, Richard’s Blend Decaf, Colombian Supremo, Kona Blend, Italian Espresso Blend, Double French Vanilla, Hazel Nut, Cinnamon Crumb Cake, Organic Fair Trade Certified Coffee. Brews one perfect pot (10-12 cups) of Organic Fair Trade Certified(TM) gourmet coffee (kosher). Each white package contains 1.5 oz. of fresh roasted ground coffee. Organic coffee is grown without the use of chemical pesticides and fertilizers. Fair Trade coffee certification assures that family farmers receive a fair price for their harvest, environmentally sustainable farming is encouraged and forced child labor is prohibited. Larger bag available. This Arabica coffee bag fit inside a mug and brews one pot (10-12 cups) of fresh roasted Kosher gourmet coffee. Great for complex graphics — prints directly on front and rear wrapper. This is just a sampling of our promotional coffee options. Drink up and keep warm. It’s cold out there!